The intersection of the three borders is marked with a triangle in the Polish town of Bolcie (Trójstyk granic), which can be accessed by transport or by walking along the pedestrian path. 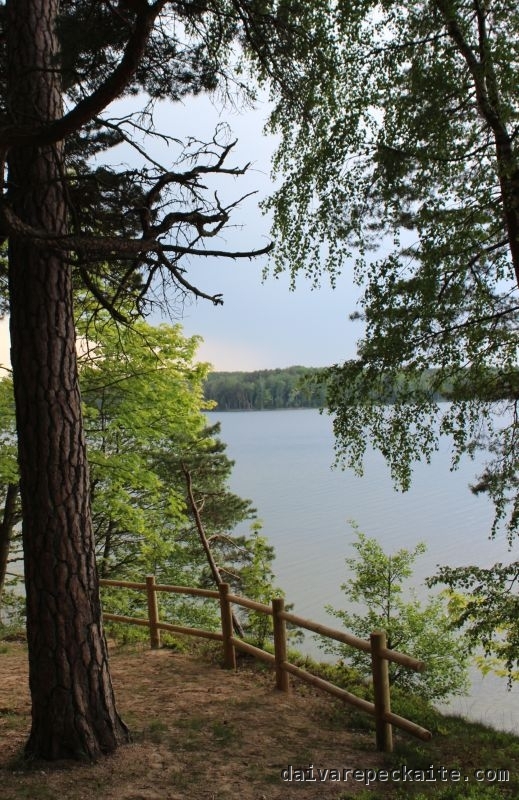 The Vištytis Regional Park website offers two tourist routes – one shorter and one longer. We started with the shorter route. 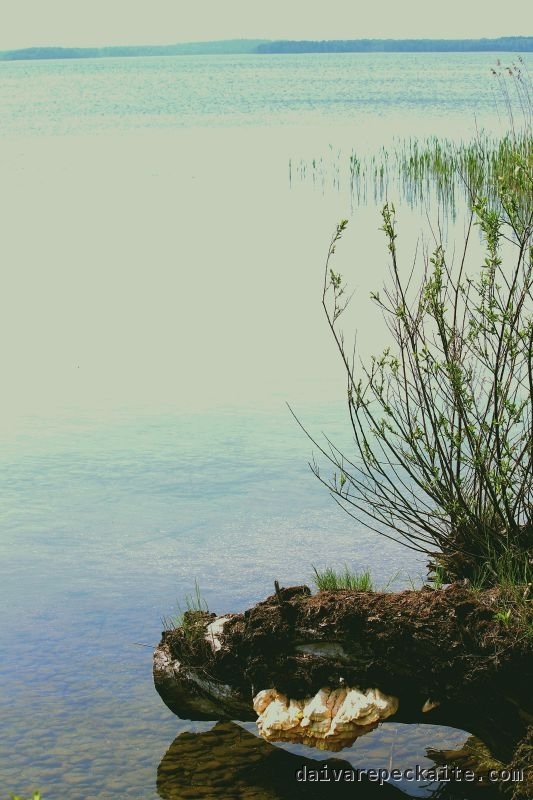 A convenient pathway, though steep in places, offers great views of the lake and two interesting natural phenomena – the witch broom and hollow trees. Both are marked with signs – however, the descriptions are in Lithuanian only. 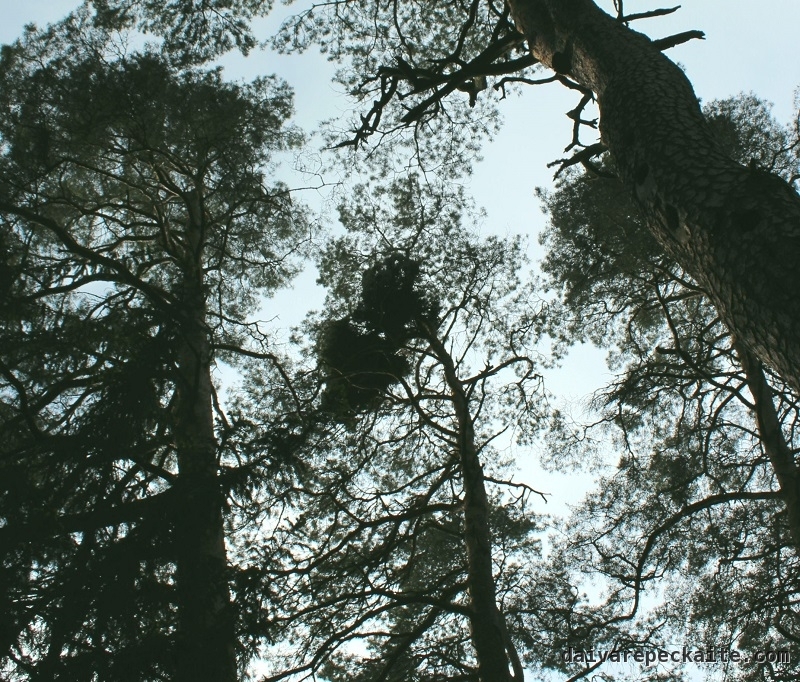 If you look up you will see tall woody pine trees and hollow trees in an orderly line, reminding us we are in a land of legends and lively imagination. On the way there are blank boards, which are probably intended to give more information. There are a few places where you can go down to the lake and have a swim. Šilelis campsite lies strategically on the path – here you can have a rest and use the toilets. One traveller even put up a hammock here. The path then leads to the Saint spring which is covered with a lid, and a cup to scoop up water is integrated among various religious elements. In the old days they used to say that the water from this spring had healing properties. 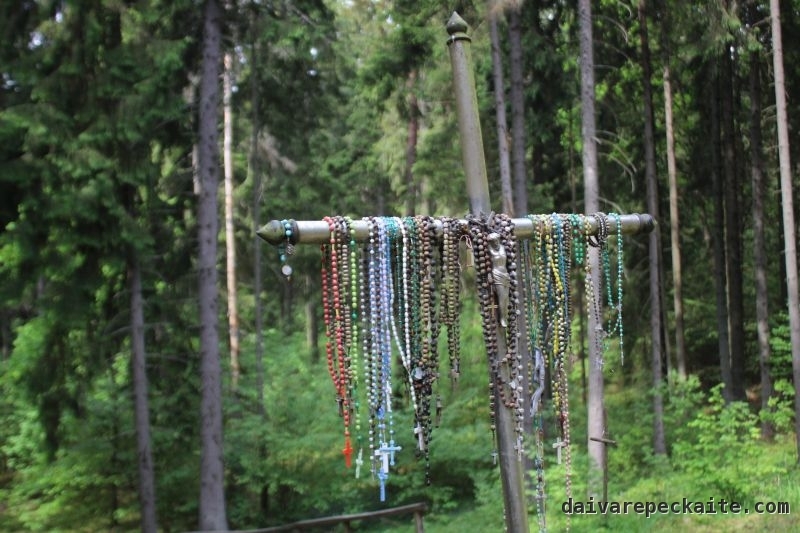 Therefore, there is a hill covered in thoughtfully leaning crosses, with rosary beads melancholically swinging on them. Those who are more interested in borders should go further towards Varteliai and the border. We returned to the car and found the longer route. This leads through the heritage parts of the towns: a modest Protestant church and a more magnificent Catholic one, and an old shabby mill. Next to them, a monument in commemoration of the Holocaust victims. At the very end of the pathway there is the famous Vištytis rock, with the devil’s foot imprinted on it, which can be seen from the road. On the other side of the stone there are ladders placed deliberately for visitors to climb – you can take great selfies from the top of it. The surroundings of Vištytis have been landscaped and tailored for tourism purposes for a few years now. In some places, EU funding logos are visible. Despite the lack of road signs and directions in other languages, it’s not difficult to find your way around if you have a smart phone and have done your research. The need to rack your brain makes you feel as if you are in search of hidden treasure. This legend-surrounded route may be a real discovery – or a new favourite place for swimming, trekking or picnics. This article is taking part in #MyWonderfulEurope campaign. Do you enjoy travelling in Europe? Share hidden travel destinations and wonders on the Wonder Map application on Facebook! You can win train tickets to travel in Europe as well as inspire others to take the road less known! Follow #MyWonderfulEurope and ‘ Europe. Wonder is all around.’ on Facebook. Learn more about “Europe. Wonder is all around.”, the European Commission’s campaign promoting tourism, here.